Norfolk State and Hampton put together a classic game with NSU getting the better of its rival in double-OT. 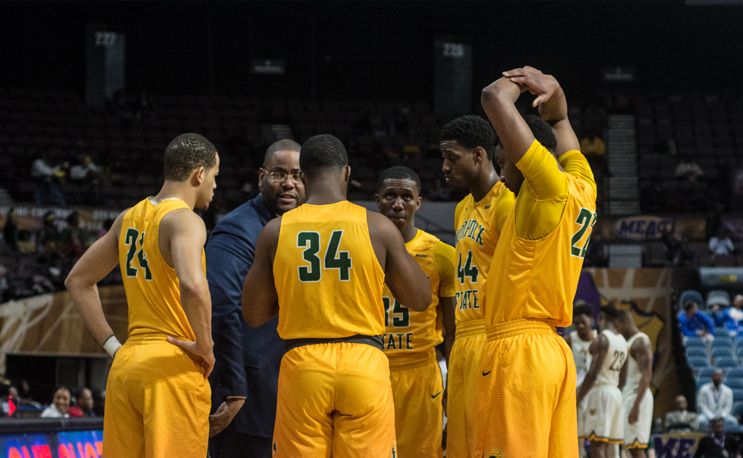 NORFOLK, Va. – In one of the wildest Battle of the Bays ever, Norfolk State survived double overtime to defeat Hampton by a 94-89 score in men’s basketball action on Thursday night in the Battle of the Bay at Joseph Echols Hall. Hampton tied the game late in regulation, and then again when less than 20 seconds to go in the first overtime. In a contest that featured 10 lead changes, NSU led most of the second extra period and held off the Pirates in the end. In 134 all-time meetings, the two teams went to two overtimes for just the second time ever and the first since 1995. What does a dagger 3-pointer against your arch-rival look and sound like? The Spartans led most of the first half, including by as much as 15. They still were up by 10 at halftime before the Pirates began the second half with a big run to jump ahead. Hampton, which ultimately fell to 2-5, later erased a seven-point deficit in the last minute and a half to send the game to OT. Thursday marked the only meeting between the two programs this year after Hampton left for the Big South Conference before the season. The game did not count toward conference records. NSU improved to 4-5 despite having three players foul out. That included senior Jordan Butler, who kept NSU ahead by making eight straight free throws in the last six minutes of regulation. He finished with 17 points, nine rebounds and five blocks, making a career-best 13-of-14 from the foul line. The Spartans shot 33-of-40 for the game, a nearly 83 percent clip from the line. But with Butler out for all of overtime, and with senior Alex Long picking up his fifth foul in the first OT, the Spartans turned to juniors Nic Thomas and Steven Whitley. Each hit the 20-point plateau for the game, and they combined for 18 points in overtime. Thomas nearly gave the Spartans the win after making two straight with 33.9 seconds left in the first extra session. That put NSU up 78-77, but Hampton’s Kalin Fisher sank 1-of-2 from the line with 16.7 seconds to go to tie it up. The Spartans missed their final attempt to send the game to the second OT. There, Whitley drained a 3-pointer at the 3:44 mark to put the Spartans ahead for good. He later made a layup to keep the Spartans ahead, while sophomore Mastadi Pitt twice made two straight from the charity stripe. Thomas provided the big boost, draining a 3-pointer from several feet beyond the right wing with 42 seconds left to give the Spartans a 90-86 lead. After HU’s Greg Heckstall completed a 3-point play, Thomas and Pitt each made 2-of-2 from the line to seal the win.